Australia has a latitudinal range of 11°S to 44°S, which, coupled with precipitation from 100 mm to 4 000 mm, generates a wide range of grassland environments. The landscape is characterized by vast plains with only limited elevated areas. Native herbage remains the basis for a significant portion of the grazing industry. Europeans settled in Australia two hundred years ago, and have had a massive impact on vegetation through agricultural development and introduction of exotic plants and animals. Most farms rely on animal products from grasslands. Grazing land tenure is a mix of freehold and leasehold from government. Family owned and operated farms remain the dominant unit. Most grassland products are exported. Arid and semi- arid tropical areas are used for extensive cattle grazing; water from artesian wells and bores is necessary. Pasture growth is very seasonal and stock lose weight in the dry season. The intermediate rainfall zone extends from south eastern Queensland through New South Wales, northern Victoria and southern South Australia, and includes part of south western Australia. Crops are combined with sheep rearing; ley farming systems, where a legume-based pasture phase of two to five years is alternated with crops for one to three years, were widely adopted in southern areas. This high-rainfall zone forms the greater part of the coastal belt and adjacent tablelands of the three eastern mainland states; sown pastures are widely used. Sheep and cattle dominate livestock numbers; wool sheep and beef cattle predominate, but dairying is locally important. Animals that compete for grazing include a range of macropods and feral domestic species. Sown pasture technology is well developed in the temperate zone, based on the use of selected, exotic species, with emphasis on legumes. Development of sown pastures was slower in the tropical areas and suffered a set-back when disease affected Stylosanthes stands. Grasslands and grazing have been important over much of Australia since human colonization and grazing remains the most widespread land use, covering approximately 70 percent of the continent. Grasslands support the native game hunted by the original Aboriginal colonists and the domestic grazing animals introduced by European colonists in the late eighteenth century. Native herbs (particularly grasses) and shrubs provided the initial grazing but these have been supplemented - and in some cases replaced - by exotic species. There are a number of descriptions of Australian grasslands (e.g. McTaggart, 1936; Moore, 1970, 1993; Groves and Williams, 1981) that have been drawn on in preparing this paper. Following Moore (1970), all herbaceous communities used for livestock production are considered grasslands, and include both native communities that are grazed and pastures composed of mainly introduced plants, either sown or volunteer. This paper concentrates on dryland or rainfed pastures, but irrigated pastures are important (approximately one million hectares), particularly in some dairying areas in southern Australia (about half of all irrigation water in Australia is used on pastures). Australia covers an area of 7.68 million km2, from 11°S to 44°S, and this latitudinal range, coupled with annual rainfalls ranging from 100 mm to more than 4 000 mm, both coastal and inland areas, and a variety of soils, generates a wide range of grassland environments. The Australian landscape is characterized by vast plains and plateaux (threequarters lie between 180 and 460 m above sea level) with only limited elevated areas. The continent can be divided into three major structural components - the stable Western Shield, the gently warped Central Basin, and the Eastern Uplands (from Tasmania to north Queensland), which are of ancient origin but have been rejuvenated to some degree. These components determine the pattern of relief and drainage. The Eastern Uplands contain the highest mountains in Australia (including Mt Kosciusko, 2 200 m) and the only area with snow. They form the divide between the steep eastern-flowing rivers and those draining west. The Central Basin has two major drainage systems - the Murray-Darling system, which includes runoff from the southeastern rim, and one draining internally to Lake Eyre. The Great Artesian Basin lies to the west of the Eastern Uplands in Queensland, New South Wales and South Australia, and water from this Basin has enabled grazing industries to establish and persist over a wide area of arid and semi -arid inland Australia. Total annual precipitation varies from more than 4 000 mm in the mountainous areas of northeast Queensland to approximately 100 mm in the north of South Australia. Approximately one-third of Australia receives over 500 mm of rain, one-third has 250 to 500 mm and one-third has less than 250 mm; rainfall is greatest in coastal areas and lower inland. Seasonal distribution varies markedly over the continent, from strong summer dominance in the north(e.g. Daly Waters in Table 9.1) to strong winter dominance in the southwest (e.g. Narrogin in Table 9.1). The total amounts and distribution reflect the continental weather systems. Monsoonal rains fall in the extreme north between November and March; tropical cyclones can affect most of northern Australia during this time but they are very erratic; and trade winds provide orographic rains to the northeast Queensland coast. In southern Australia, in contrast, the most precipitation comes from frontal rains occurring from May to September. Climate data for selected stations. Rainfall periods are October-March (summer) and April- September (winter). Maximum temperature is the average daily maximum temperature during the hottest month and minimum temperature is the average daily minimum temperature during the coldest month. SOURCE: Data from the Bureau of Meteorology Climate Averages. Erratic rainfall, disastrous droughts and occasional floods are a feature of the Australian climate. When variability is expressed in terms of the mean deviation as a percentage of the annual mean, the most reliable areas are the northwest coast near Darwin, the southwest of Western Australia, coastal areas in South Australia, Victoria and New South Wales, and Tasmania. Variability increases inland, and the great bulk of Australian rangelands have highly erratic rainfall. Maximum variability is found on the western coast near the Tropic of Capricorn and in central Australia. Much of the variation in rainfall in eastern Australia can be related to the ENSO (El Niño-Southern Oscillation) phenomenon of sea surface temperatures and atmospheric pressures over the Pacific Ocean. Summers are warm to hot (Table 9.1). Maximum temperatures above 38°C are common in inland areas and, apart from the mountains of the southeast, can occur occasionally in other areas. Winters are warm in northern Australia and cold in the south, with occasional snow above 600 m. Frosts occur in all regions except the extreme north, and coastal areas in other tropical and subtropical regions. Evaporation is lowest in the Tasmanian highlands. On the mainland, evaporation is lowest in coastal areas and increases inland to maximum values exceeding 3 000 mm in central Australia. The generally mild conditions make it unnecessary to house animals during winter. Given the variation in amount and distribution of rainfall and the temperature range over the continent, it is not surprising there is a wide range in growing seasons - from no reliable season in arid inland areas, to almost year-long seasons in some coastal areas. Fitzpatrick and Nix (1970) described a method for estimating growing seasons from climatic data. They developed indices varying in value from zero to one for light, temperature and moisture. A value of zero means that the level of that factor is so low that all growth is prevented; a value of one means that there is no limitation to growth by that factor. The three indices are then combined to produce a growth index that measures the combined impact of all factors. Figure 9.1 shows the average weekly values of the temperature and moisture indices for four sites in Table 9.1 and demonstrates a range of growing seasons (the light index has been omitted as radiation is usually not limiting to growth). At Hamilton (in the high rainfall zone of the section on "pastoral and agricultural systems ", below), moisture limits growth in summer but there is often sufficient for some growth. Moisture availability increases rapidly in autumn and there is a period of increased growth until low temperatures limit growth in winter, followed by a spring "flush" before water again becomes limiting in summer. At Narrogin (wheat-sheep zone) there is almost no summer moisture and growth occurs mainly in autumn and spring although the temperature limitations in winter are not as severe as those at Hamilton. At Cairns, in the wet tropics of northeast Queensland, both temperature and moisture levels are high during the wet season and the major limit to growth is moisture during the dry season. At Charleville (in the pastoral zone), average moisture levels are low throughout the whole year (although they can be high at any time of the year in a particular year) and temperatures are severely limiting for tropical species in winter. Average weekly water and temperature indices for selected Australian locations. SOURCE: Fitzpatrick and Nix, 1970. NOTES: water indices were calculate dusing the WATBAL model (keig and McAlpine, 1974) and temperature indices were estimated from the relationships of Fitzpatrick and nix (1970) for tropical legumes (cairns and Charleville) and temperate species (Hamilton and Narrogin). A value of 0 means that the level of that factor is so low that all grow this prevented, and a value of 1 means that there is no limitation to growth by that factor. Hubble (1970) identified three important features of Australian soils. First, the generally low nutrient status, with widespread and severe deficiencies of nitrogen and phosphorus (and sometimes sulphur), and varying deficiencies of trace elements (copper, zinc, molybdenum, cobalt, manganese, boron). Multiple deficiencies are common and, as Morley (1961) remarked, "Australian soils are rich only in the diversity and intensity of their deficiencies." Second, the poor physical condition of surface soils, which, over large areas, are massive or weakly structured with low macroporosity, set hard on drying and tend to surface sealing. As a result, water infiltration is often poor and water storage low. Third, over large areas, the soils have strongly weathered or differentiated profiles, including those with strong texture contrast. Good soils (deep, fertile, well drained) are not common and are used for cropping if the climate is suitable, leaving the poorer soils for pastures. Sheep and cattle dominate the Australian livestock numbers, but there have been marked changes in their relative importance over the past 30 years. The majority of the sheep are Merinos for wool, but British breeds and their crosses with Merinos are important for lamb production. Sheep numbers peaked at 180 million in 1970, then declined, but rose again to 170 million in 1990. Market prospects for wool have been poor since then and numbers declined to 119 million in 2000. Most of the cattle are beef animals but dairying is important in wetter coastal areas and some irrigation districts, particularly in Victoria. Cattle numbers reached a peak of 33 million in 1976, then fell until the mid -1980s, but have since increased to 24 million beef cattle and 3 million dairy cattle in 2000. There are important goat herds in some inland areas, and an estimated feral goat population of 4.5 million and a small deer industry with approximately 200 000 animals. Australia has large populations of wildlife, including both native species and feral populations of exotic animals. There are a number of important predators (dingo, fox, wild pig, raven or crow, eagle), and also a range of animals that compete for grazing. These include a range of macropods (kangaroos, wallabies) and also domestic species (rabbits, donkeys, horses, camels). Rabbits have been and continue to be large competitors with domestic stock, although their numbers have been reduced by myxoma virus since the 1950s, and more recently by rabbit calicivirus. Australia had no equivalent of the huge herds of herbivores in parts of Africa or America, and the native plants evolved under conditions of generally light grazing, which has had serious consequences for their survival under increased grazing pressures since European settlement. The date of settlement of Australia by humans is debated, but there have been Aborigines in Australia for over 60 000 years; they were primarily hunters and their major influence on the grasslands would have been through widespread use of fire, to encourage feed for their prey and to assist with hunting. In contrast to this long period of Aboriginal occupation, Europeans only settled in Australia a little over 200 years ago, but in this time they have had massive impacts on the vegetation, both intentional (tree clearing, cropping and sown pasture introductions, fertilizer application, domestic grazing animals, etc.) and accidental (weeds, pest animals). Settlement was rapid and almost all suitable lands were occupied by the end of the nineteenth century. Despite this rapid spread, the population remains concentrated in major cities and coastal urban areas, with only a sparse population in the interior. Approximately 80 percent of Australia, including all the pastoral zone (see section below), has a population density of less than 1 person/km2. For example, the Diamantina Shire in southwest Queensland has an area of 94 832 km2 and had a resident population of 319 in the 2001 Census. Until 1901, Australia consisted of six self-governing British colonies, which federated in 1901 to become states of the Commonwealth of Australia, with democratically elected governments at national, state and local levels. Specific powers were transferred to the Commonwealth government (e.g. defence, immigration, social welfare) but many important powers affecting agriculture remain State responsibilities, including land use and ownership, water supplies, and control of pests and noxious weeds. Grazing land tenure in Australia is a mix of freehold and leasehold from government. Freehold is commonest in the higher rainfall areas, with leasehold most important in the extensive grazing lands in the tropics and arid inland Australia. Overall, only approximately 10 percent of land is privately owned, but the proportion varies widely between states and territories, from less than 1 percent in the Northern Territory to approximately 60 percent in Victoria. Leases vary from state to state, from annual to perpetual, although the majority are for long periods, and the conditions also vary, e.g. improvements (buildings, fences, water supplies) to be made, and stock numbers to be carried. There have been some important changes in the last decade: Aboriginal land rights have raised uncertainties concerning the rights of pastoral lessees; increasing emphasis on land condition in pastoral leases; and increasingly restrictive conditions on the use and management of freehold land in relation to vegetation management, particularly tree clearing. Approximately 90 000 of Australias 145 000 agricultural properties rely on animal products from pastures and grasslands (Anon., 1999). Family owned and operated farms have been, and remain, the dominant structural unit in Australian agriculture. In a 1994-95 survey by the Australian Bureau of Agricultural and Resource Economics (ABARE), 99.6 percent of all broadacre (grazing, cropping) and dairy farms were family owned and only 0.4 percent were corporately operated (i.e. at least partially owned by a publicly listed company) (Martin, 1996). Corporate ownership is most significant in the beef industry, particularly in northern Australia. However, even in the beef industry in 1996-97, only 1.1 percent of specialist beef properties were corporately owned (Martin et al., 1998). The corporate properties were much larger (47 percent of the total property area) and owned more cattle (19 percent of total numbers). The majority of family-owned properties are in New South Wales (31 percent of all fam-ily-owned farms), Queensland (28 percent) and Victoria (26 percent), whereas the corporate properties are mainly in Queensland (40 percent of all corporate properties) and the Northern Territory (32 percent). Farm numbers are declining as properties amalgamate, and numbers have halved in the last forty years. Land is a State government responsibility under the Australian Constitution. All states and territories have lands departments responsible for titles and some aspects of management. During the early years of European settlement emphasis was placed on the occupation of land and establishing and maintaining agricultural production. After the gold rushes in the 1850s, there were demands for large numbers of small farms to develop the country and stimulate economic development. Closer Settlement Acts were passed in the 1860s and Government sponsored closer settlement schemes to promote rural development remained important until the 1970s, especially after both World Wars. This emphasis on agricultural production continued until recently; now increased stress has been placed on land management issues. Agricultural production is privately controlled, but Australia has had a variety of marketing mechanisms for agricultural products. However, with the cessation of the wool reserve price scheme in 1992, these mechanisms are no longer important for products from grasslands. Most of the production from grasslands is exported. For the three years from 1994 to 1997 (ABARE, 1998) Australia produced an average of 1 800 000 t of beef and veal and 582 000 t of mutton and lamb - 42 percent and 56 percent, respectively, of which was exported, together with 628 000 live cattle and 5.6 million live sheep. Whole milk production averaged 8 650 million litres, and although only a small amount was exported as whole milk (71 million litres), 64 percent of the 739 000 t of dairy products (butter, cheese, whole milk powder, skim milk powder, casein) were exported. Average wool production during this period was 718 000 t and the amount exported exceeded this figure with the sell-off of accumulated supplies. This dependence on exports means that international prices have a large impact on returns to producers. Many factors affect the agricultural system adopted in an area - climate and growing conditions, soil type, topography, markets, distance to markets, labour availability, etc. Animal production systems can be conveniently considered in the three zones used by ABARE - the pastoral zone, the wheat-sheep zone and the high rainfall zone. These differ in the manner in which land and resources are used and the commodities produced. This zone includes the arid and semi -arid regions and most of the northern tropical areas. Agricultural land use in this zone is characterized by extensive grazing of native vegetation. Although some cropping is undertaken, it is impractical on most properties because of inadequate rainfall. Corporate property ownership is more important than in the other two zones. 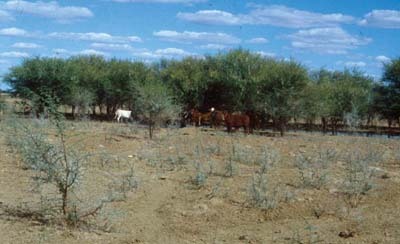 The native vegetation in the arid interior has been used since the mid -nineteenth century, with wool production most important in southern Australia and beef most important in central and northern Australia. Sown pastures are of very restricted and minor importance. The zone has no reliable growing season, droughts occur frequently and production and financial returns vary from year to year. Water supplies from artesian and sub-artesian bores are critical for continued animal production over wide areas. The beef industry is based on breeding, with some animals grown and fattened locally, but many sent elsewhere for fattening, including to the flooded natural pastures of the Channel country in western Queensland. The wool industry is based almost entirely on grazing Merinos on native pastures for medium quality wool. Properties are large (5 000 to more than 100 000 ha, with 5 000 to 20 000 sheep) and, due to wide fluctuations in pasture yield and quality, stocking rates are low (one sheep to 2-40 ha). Wool production levels are satisfactory, but lambing percentages are often low in the harsh environment. Despite this, most operations are breeding flocks. In times of high cereal prices there is some cropping on the higher rainfall margins of the zone, but animal products are the major source of income. The tropical grazing lands have a reliable summer growing season and winter dry season. Pasture growth is rapid during the early growing season and herbage quality is high, but later drops to low levels; animals gain weight during the growing season and lose in the dry season. Beef production is the only major land use. Initially all cattle were Bos taurus breeds (especially Shorthorn); now almost all are Bos indicus or their crosses, which are better adapted, with greater resistance to heat stress, stronger resistance to ticks, increased foraging ability and a higher forage intake (Frisch and Vercoe, 1977; Siebert, 1982), leading to superior growth, breeding performance and survival. The zone is an important source of stores for fattening elsewhere, and production of grade beef for the United States of America market has been a major outlet. In the past decade, an important trade in live cattle to southeast Asia has developed. This has been particularly important for beef producers in northwestern Australia, who are close to these markets but remote from markets in Australia and also from abattoirs. The tropical grazing lands range from the more productive areas of coastal and central Queensland to the remote parts of the Kimberley and Cape York Peninsula. There are major differences between these regions. In coastal and central Queensland, the properties and herds are smaller (typically less than 10 000 ha and carrying 500 to 2 000 cattle), animal husbandry and management inputs are greater, animal productivity is higher and the north Asian markets are important. In the remote areas, properties and herds are much larger (200 000 to 500 000 ha, with 6 000 to 8 000 cattle), animal productivity is lower and the live export, store and American markets are most important. Sown pastures are important in eastern and central Queensland, but, apart from limited areas in the "Top End" of the Northern Territory, they are of minor importance elsewhere, and cattle depend on native pastures. A number of introduced species are now naturalized (e.g. Stylosanthes spp., Cenchrus ciliaris). The use of feed supplements (particularly urea-based ones) is widespread. Cereal cropping is important in central and southern Queensland and is sometimes integrated with animal production in ley pasture rotation s.
The wheat-sheep zone has a climate and topography that generally allows regular cropping of grains in addition to the grazing of sheep and cattle on a more intensive basis than in the pastoral zone. Rainfall is generally adequate for a range of pasture species, usually in a crop-pasture rotation. Farms are much smaller than those in the pastoral zone but larger than those in the high rainfall zone. This zone of intermediate rainfall extends from southeastern Queensland (500-750 mm annual rainfall) through the slopes and plains of New South Wales (300-600 mm), northern Victoria (300-550 mm) and southern South Australia (250-500 mm), and includes part of southwestern Australia (250- 700 mm). The most important crops are wheat, barley, oats, grain legumes, pulses and oilseeds, with sorghum important in the northern areas. Merino wool growing (medium fibre diameter), fat lamb and beef production are the major animal industries. Both crop and animal products are important income sources and the balance between land uses depends largely on relative financial returns; in recent years there has been an increase in crops and a large decrease in wool. The more reliable seasonal conditions than in the pastoral zone and the flexibility of multiple income sources leads to more stable income. Family owned farms dominate in this zone. Ley farming systems, where a pasture phase of two to five years is alternated with a crop phase of one to three years, were widely adopted in southern areas after the Second World War. The short -term pastures are important for improving soil fertility and providing disease breaks for subsequent crops, as well as animal production. Almost all pasture plants are annuals, reflecting both the length of the growing season and the ease of removing them for the cropping phase. Subterranean clover (Trifolium subterraneum) is widely used on the acidic soils and annual medics (Medicago spp.) on more alkaline soils in drier areas. These pastures provide both high quality grazing for animals and improved soil structure and increased soil nitrogen for utilization by crops. However, as discussed later, productivity of these legume pastures has declined. This has led to some farmers switching to continuous cropping using grain legumes and fertilizer to supply nitrogen, minimum tillage to maintain soil physical conditions, alternation of cereals with grain legumes, pulses and oilseeds for disease control, and herbicides for weed control. Feedlots (where cattle are confined in yards and completely hand or mechanically fed to attain high levels of production) has become important in Australia in the last 30 years. There are about 800 accredited feedlots with a capacity of 900 000 head. They are mostly in Queensland and New South Wales and serve both the domestic and export markets (especially Japan). Cattle which previously would have been grass fed are finished on a diet of grain for 30 to 300 days (but most commonly 90-120 days) depending on the market. This zone forms the greater part of the coastal belt and adjacent tablelands of the three eastern mainland states, small areas in southeastern South Australia and southwestern Western Australia, and the whole of Tasmania. Rainfall is summer-dominant or spread throughout the year in Queensland and northern New South Wales, and winter-dominant in southern areas. Higher rainfall, steeper topography, more adequate surface water and greater humidity make this zone less suitable than the wheat-sheep zone for grain-based cropping, but more suitable for grazing and growing other crops, but there has been an increase in cereal growing with new cultivars in recent years. These wetter areas have a longer growing season than the other zones and pasture improvement is widespread, with Trifolium subterraneum and, in the wetter areas, T. repens and Lolium perenne as important species. Production of wool, prime lambs and beef are important, and all three are carried out on some properties, giving increased stability of income. Farm sizes range from small, often part-time operations, to large enterprises of more than 5 000 ha. In contrast to the pastoral and wheat belt farms, where medium quality wool dominates, fine wool production is more important in these wetter areas. Dairying is limited to areas with a long growing season (or irrigation) for the production of high quality pastures. Victoria and New South Wales are the major dairy producing states. Although the feeding of concentrates is increasing, production is pasture -based and farms consist almost entirely of sown pastures. Income is derived from milk sales for whole milk consumption and manufacturing and sales of surplus cattle. Most dairy farms are operated by their owners, with the family providing most of the labour. There have been massive changes in the dairy industry during the past 30 years, with fewer farms and farmers and large increases in production per cow and per hectare. Average herd size has increased to 150 head, with some herds of more than 1 000 cows. Despite the amount of pasture development, native herbage remains the base of a significant portion of the grazing industry. There have been a number of classifications and descriptions of the Australian vegetation (e.g. Leeper, 1970; Carnahan, 1989; Thackway and Cresswell, 1995). Moore (1970) classified the Australian grazing lands into 13 groups on the basis of climate, the characteristics and height of the major grasses (tall: >90 cm; mid: 45-90 cm; short: <45 cm) and important species. Three of the groups are of little value for grazing (heaths and sedgelands, mallee, forest lands). The distribution of the other ten groups is shown in Figure 9.2 and they are described below, drawing largely on Moore (1970, 1993), with additional information from the detailed descriptions of pasture lands of northern Australia in Tothill and Gillies (1992). 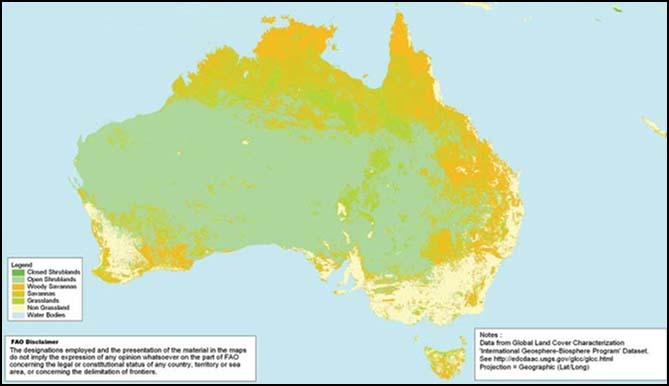 The extent of grasslands in Australia is shown in Figure 9.3. These communities are the grassy understorey of tropical woodlands which extend in an arc across northern Australia and have been further divided into monsoon, tropical and subtropical by Mott et al. (1985) and Tothill and Gillies (1992). Monsoon tall -grass communities occur in regions with annual rainfall greater than 750 mm and a highly reliable distribution of wet and dry season s, in the northern Kimberley region of Western Australia, the "Top End" of the Northern Territory, and northern Cape York Peninsula in Queensland. In contrast, the tropical (northeastern Queensland) and subtropical (southeastern Queensland) tall -grass communities have a less defined and more unreliable rainfall pattern, and usually less than 750 mm annual rainfall. 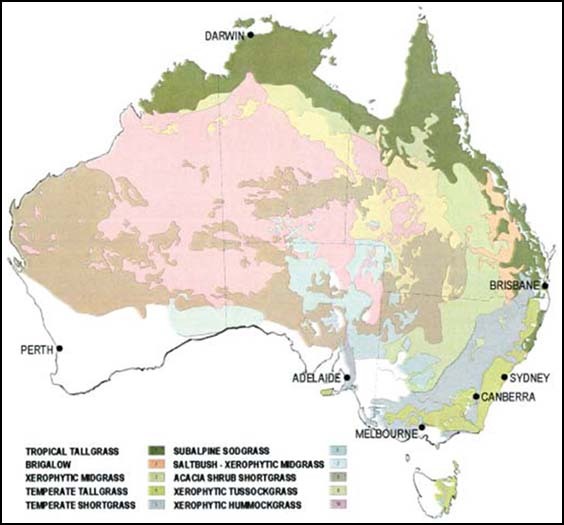 Natural vegetation zones of Australia. SOURCE: Adapted from Moore, 1970. 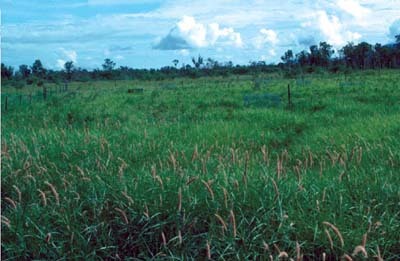 Tropical tall -grass community dominated by Themeda triandra in northeast Queensland. Extent of grasslands in Australia. Within the monsoon tall -grass communities, those dominated by perennial grasses (Themeda triandra (Plate 9.1), Chrysopogon fallax, Sorghum plumosum, Sehima nervosum, Heteropogon contortus and Aristida spp.) occur on texture contrast and earth soils, and communities dominated by annuals (Sorghum spp., Schizachyrium fragile) grow on sands and skeletal soils. Heteropogon contortus is an important species in the tropical and subtropical tall -grass communities in eastern Queensland. Originally, Themeda triandra was commoner, and in some areas Heteropogon contortus is decreasing and the stoloniferous grasses Bothriochloa pertusa and Digitaria didactyla are increasing. Other important genera are Bothriochloa, Dichanthium, Chrysopogon and Aristida. Treeless grasslands dominated by Dichanthium and Bothriochloa spp. occur on cracking clays. Tree clearing to increase herbage growth has been widespread in the subtropical tall -grass, but less important in the tropical and monsoon areas, where the yield responses are less (Mott et al., 1985). Brigalow (Acacia harpophylla) forest and woodlands extend from central Queensland to northern New South Wales on medium to high fertility clays or loams. A variety of other woody species also occur (Eucalyptus, Acacia, Casuarina, Terminalia). The native understoreys are sparse and unproductive, with major grasses being species of Paspalidium, Bothriochloa, Aristida and Chloris. These communities have been extensively cleared for development to exploit their natural fertility by sown introduced pastures (mainly based on the grasses Cenchrus ciliaris, Chloris gayana and Panicum maximum var. trichoglume) and cropping. These grasslands form the herbaceous layer of semi -arid low woodlands on a wide range of light soils of poor to moderate fertility in both northern and southern Australia. In northern Australia they occur in a subcoastal arc inland from the tropical tall -grass communities, in Western Australia, the Northern Territory and Queensland in areas with 350-750 mm annual rainfall. They have variable composition, with a range of dominant species including Aristida spp., Chloris spp., Bothriochloa decipiens, B. ewartiana, Eriachne spp., Digitaria spp. and Chrysopogon fallax. Annuals are also important (Sporobolus australasicus, Aristida spp., Dactyloctenium radulans). The southern component is widespread in western New South Wales, where Danthonia spp., Chloris truncata, C. acicularis, Stipa variabilis, S. setacea, S. aristiglumis and species of Eragrostis, Aristida, Enneapogon and Enteropogon are important. These woodlands have variable tree and shrub layers. Tree clearing has been important in central and southern Queensland and New South Wales. Major increases in the density of the shrub layer (species of Eremophila, Cassia, Dodonaea and Acacia) have reduced grass production and threaten the viability of grazing in some areas. Dichelachne spp., Poa labillardieri and Themeda triandra give sparse grazing in the wetter forest and heath areas of eastern New South Wales, Victoria and Tasmania, and also in the dry sclerophyllous forests, where Danthonia pallida is also important. These pastures are of low grazing value and animal production in these areas depends on clearing and the development of sown pastures. Apart from small areas of treeless grassland, these communities form the herbaceous layer of temperate woodlands growing on a range of soils extending from southern Queensland through New South Wales and Victoria to southeast South Australia, with other areas near Adelaide, in Tasmania and in the southwest of Western Australia. Annual rainfall varies from 400 to 650 mm, with summer dominance in the north and winter dominance in the south. These woodlands were among the first areas used for domestic livestock and have been extensively modified by clearing, grazing, fertilizer application and the introduction of exotic species. They were originally composed of taller, warm-season grasses (Themeda triandra, T. avenacea, Stipa bigeniculata, S. aristiglumis, Poa labillardieri) but with higher grazing pressures since European settlement these have been replaced by short, cool-season species (Danthonia spp., Stipa variabilis, Chloris spp.) and exotic annuals (Hordeum leporinum, Bromus spp., Trifolium spp., Medicago spp., Erodium spp. and Arctotheca calendula). Small areas of this community occur as treeless grasslands or the understorey of subalpine woodlands on acid soils with annual rainfall above 750 mm in the southeastern highlands. The principal grasses are Poa spp., Danthonia nudiflora and Themeda triandra. Historically, these grasslands were used for summer grazing, often after burning during early summer, but grazing has declined as emphasis is now placed on water supply, tourism and conservation. These communities are often treeless and are characterized by chenopod shrubs, usually less than one metre tall, from the genera Atriplex, Maireana, Sclerolaena, Rhagodia and Enchylaena. They are important in New South Wales, South Australia (Plate 9.2) and Western Australia, with smaller amounts in Queensland and the Northern Territory in areas with 125 to 400 mm rainfall. The space between the shrubs is covered with annual grasses and forbs after rain - in the south they are Danthonia caespitosa, Stipa variabilis, Chloris truncata and species of Calandrinia, Ptilotus and Sclerolaena. In the north, Enneapogon spp., Eragrostis spp., Aristida spp. and Dactyloctenium radulans are important. Grazing animals show marked preferences for different species in these communities. Studies in southern New South Wales (Leigh and Mulham, 1966a,b, 1967) showed animals prefer green grasses and forbs, then dry grass and forbs, followed by annual and short -lived perennial chenopods, with the perennial Atriplex and Maireana shrubs least preferred. The perennial saltbush plants confer stability to the soils and vegetation and serve as an important drought reserve; during droughts, saltbush may be a major part of the diet. The combination of drought and overgrazing has led to loss of saltbush, with the palatable Atriplex and Maireana species disappearing. Saltbush community in South Australia. 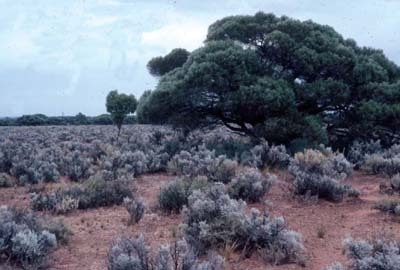 Acacia shrublands are widespread in arid Australia on lighter textured infertile soils in all states except Victoria. Mulga (Acacia aneura) is the major shrub, but other Acacia, Cassia and Eremophila species are also important, plus chenopods in southern areas. These shrubs provide important "top feed" and mulga in particular is lopped or pushed over to provide feed for stock during droughts. The herbage layer is dominated by annual and short -lived perennial grasses and forbs. The principal grasses are Eragrostis spp., Monachather paradoxus, Eriachne spp., Aristida contorta, Thyridolepsis mitchelliana, Stipa spp., Neurachne spp. and Enneapogon spp. Common forbs are species of Calotis, Helipterum and Ptilotus. Acacia nilotica thicket and seedlings (foreground) in a Mitchell grass community. Animal production depends on the herbage layer, the composition of which varies widely, depending on the timing of the unreliable rainfall in these arid areas. Winter rain produces a flush of ephemerals with forbs (particularly members of the Asteraceae) prominent; summer rain favours perennial and annual grasses and is responsible for the bulk of the herbage. 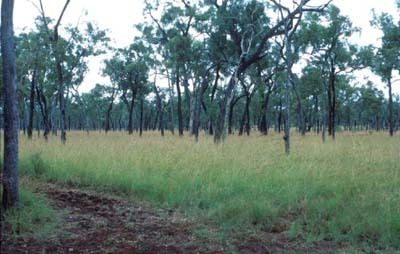 Communities dominated by Mitchell grass (Astrebla species) are widespread (40 million hectares) on heavy, cracking clay plains of inland northern Australia, particularly in Queensland. Many of these are true grasslands, with no trees, but large areas also have scattered trees and shrubs. Some areas have been invaded by the exotic tree Acacia nilotica (see Plate 9.3). The perennial Astrebla plants provide stability and drought reserve feed, but animal production is closely related to the growth of short -lived, nutritious inter-tussock species, mainly annual grasses (particularly Iseilema spp., but also Dactyloctenium spp. and Brachyachne convergens) and forbs (species of Boerhavia, Sida, Portulaca and Ipomoea). Cattle can gain weight on dry annual herbage, but lose weight when depending on dry Mitchell grass. Other perennial grasses may also be important - Panicum decompositum, Aristida latifolia, Eragrostis spp., Bothriochloa spp., Dichanthium spp., Eulalia aurea and Chrysopogon fallax. The Mitchell grass lands are the most productive of the semi -arid and arid grazing lands in Australia. They have been stable, withstanding prolonged heavy grazing, although there is concern about invasion by Aristida latifolia in some areas. These communities - characterized by perennial species of Plectrachne and Triodia ("spinifex ") - occupy large areas of sandy soils with annual rainfalls of 200 to 400 mm, and shallow skeletal soils in higher rainfall areas. Plectrachne and Triodia plants form hummocks or mounds from 1 to 6 m in diameter, and there are sparse populations of shrubs and small trees (Acacia spp. and Eucalyptus spp.) throughout much of the area. These areas have low and erratic rainfall and include waterless deserts of little or no value for grazing. Although the spinifex grasses are generally unpalatable to stock except after fire, and the mature herbage is very low quality, these lands provide important grazing (mainly for breeding cattle), especially if other, more palatable, perennial species (e.g. Chrysopogon fallax, Eragrostis spp.) are present. After rain, annual grasses and forbs provide valuable grazing. Pasture improvement in Australia has been and continues to be, based on the use of selected, exotic species, with particular emphasis on legumes. Many of these have been intentional introductions, but others are local strains of accidental introductions, such as many Trifolium subterraneum cultivars. Changes since 1950 in the area of sown pastures and the area of pasture fertilized. (a) Queensland. This area is mainly tropical pastures and includes most of the tropical pastures sown in Australia. (b) Remainder of Australia. This area is almost all temperate pastures and occurs mainly in Western Australia, New South Wales, Victoria and South Australia. SOURCE: Data from the Australian Bureau of Statistics and ABARE. Although the native communities described in the section on natural vegetation still remain important, introduction of exotic pasture species commenced at or soon after European settlement. The poor quality of pastures near Sydney was soon recognized and requests for pasture legumes and grasses were made before 1800, and lucerne and clovers were among the non-indigenous plants growing in the Colony in 1803 (Davidson and Davidson, 1993). By the early twentieth century, many of the pasture plants currently used were already being exploited, although on a much smaller scale than at present (Lolium perenne, L. multiflorum, Dactylis glomerata, Medicago sativa, Trifolium repens, T. pratense, T. fragiferum, Paspalum dilatatum, Panicum maximum) (Davies, 1951). In addition, there had been a number of accidental introductions that were to be of great importance, although their potential had not been recognized (e.g. Trifolium subterranean, annual Medicago spp., Cenchrus ciliaris and Stylosanthes humilis). There have been considerable differences between the development of temperate and tropical pastures and these are considered separately in the following sections. Figure 9.4 shows the changes in the area of sown pastures from 1950 onwards for Queensland (mainly tropical pastures) and the remainder of Australia (mainly temperate pastures). During the first 50 years of the twentieth century, much information was gathered on temperate pasture species and their growth requirements: A.W. Howard had actively promoted subterranean clover; the superphosphate responses by pastures had been documented; and the role of trace elements had been discovered. Until the 1920s, emphasis was on identifying suitable species, but thereafter the search shifted to strains and cultivars within species. These developments provided the base for sown pastures but the depression of the 1930s and drought and war during the 1940s meant large-scale pasture improvement (the "sub and super" revolution based on widespread sowing of Trifolium subterraneum and the application of superphosphate) was delayed until the early 1950s (Crofts, 1997). During this period, there were high or record prices for wool, wheat, butter and beef; myxoma virus dramatically reduced the rabbit population; seasons were favourable; and a period of rapid and sustained pasture development commenced, which continued until the late 1960s (Figure 9.4). As Figure 9.4 shows, there has been little change in the area of temperate sown pastures since 1970. This decline in pasture development has had a number of causes - periods of unprofitable prices for wool, beef and wheat; continuing cost-price pressures on farmers; major widespread droughts; rapid increase in the price of superphosphate during the oil crisis in the 1970s; removal of the superphosphate bounty; and reduced income tax deductions for pasture improvement (Crofts, 1997). Fertilizer application has been a key component of pasture development in temperate areas and approximately 90 percent of the fertilizer used is superphosphate. Superphosphate was tested on pastures in southern Australia early in the twentieth century and its impacts on pasture and animal production documented (e.g. Trumble and Donald, 1938). Figure 9.4 shows that during the 1950s the area of pasture treated with fertilizer was similar to the total sown pasture area, but the proportion fertilized then declined to 80 percent during the 1960s, to 56 percent in the 1970s and 46 percent in the 1980s. This decline has continued since, and a recent ABARE survey of grain-producing farms found that less than 10 percent of the pastures were fertilized (Hooper and Helati, 1999). The results of a number of surveys of commercial sown pastures were summarized by Wilson and Simpson (1993). There were numerous reports of "legume decline " covering Trifolium subterraneum, Medicago species and Trifolium repens in both the high-rainfall and wheat-sheep zones. Weedy annual grasses and forbs were prominent in both zones. Many reasons have been suggested for the legume decline, including reduced phosphate application; other nutrient deficiencies; soil acidity and associated nutrient imbalances; increased nitrogen levels; insect pests; diseases; and increased grazing pressure (Wilson and Simpson, 1993). These changes have had serious consequences - herbage quantity and quality have declined, reducing animal production, while in the cropping areas, where the legume-based pastures had maintained soil fertility, soil nitrogen levels have fallen and soil structure deteriorated. Development of sown pastures was slower in the tropical areas, but the success of introduced pastures in southern Australia during the 1950s provided a model for similar development in tropical Australia. A number of species had been introduced during the late nineteenth and early twentieth centuries, either intentionally (e.g. Panicum maximum, Chloris gayana and Brachiaria mutica) or accidentally (e.g. Stylosanthes humilis and Cenchrus ciliaris (Plate 9.4)). Plant introduction and evaluation has continued, with initial emphasis on grasses, but increasing attention has since been paid to legumes, especially after a major expansion of research in the 1950s (Eyles and Cameron, 1985). Most of the tropical pastures have been sown in Queensland, with smaller areas in northern New South Wales, the Northern Territory and Western Australia. Figure 9.6 shows a slow increase in the area of sown pasture in Queensland until 1960, followed by a rapid expansion in pasture sowings from the 1960s onwards, about ten years after a similar increase in temperate Australia. This expansion continued until the 1990s, apart from decreases in the late 1990s and late 1980s associated with disease outbreaks in Stylosanthes humilis stands, poor returns for animal products and expansion of cropping areas (Walker and Weston, 1990). About 70 percent of the area sown to pasture has been sown solely to grasses. These grass -only pastures are mainly on fertile soils, particularly those which previously supported brigalow (Acacia harpophylla) and gidgee (A. cambagei). In contrast, sown grass- legume pastures are more important on less fertile soils (Walker and Weston, 1990). A special development has been the use of shallow ponds to grow flood -tolerant grasses (Brachiaria mutica, Hymenachne amplexicaulis and Echinochloa polystachya) to provide green herbage during the dry season. Buffel grass (Cenchrus ciliaris), the most widely planted grass in semi -arid tropical areas. Buffel grass can support high levels of animal production, but has also been listed as an environmental weed. 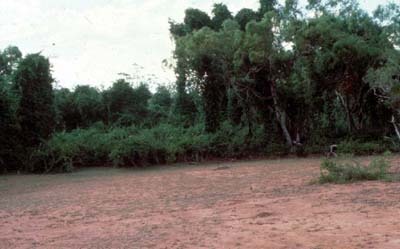 Sward of Stylosanthes hamata growing under trees in the Northern Territory. In contrast to southern Australia, fertilizer application has been much less important in tropical pasture development. This partly reflects the use of grass -only pastures on fertile soils and also the importance of the Stylosanthes species (see Plate 9.5) with their low phosphorus requirements and ability to grow well on soils with low available phosphorus (4-8 ppm) levels (McIvor, 1984; Jones et al., 1997). As for southern Australia, superphosphate dominates fertilizer usage on pasture, comprising approximately 70 percent of the total fertilizer applied. However, nitrogen-fertilized grasses have important specialized roles, including pastures based on temperate species for winter production on some dairy farms. There have been no surveys for sown tropical pastures equivalent to those noted above in temperate areas. However, there are problems with some sown pastures, with approximately 100 000 ha per year going out of production during the period 1986/87 to 1989/90 (Walker, 1991) due to a decline in sown species (Walker and Weston, 1990). Although grass -only pastures on fertile soils are initially very productive, this phase generally lasts only four to ten years then plant and animal productivity declines due to reductions in available nitrogen and sometimes loss of desirable species (Myers and Robbins, 1991; Jones, McDonald and Silvey, 1995). There are currently nearly 500 cultivars registered or where applications for plant breeders rights have been granted. These include fodder crops, lawn-amenity grasses and shrub legumes, but most are pasture grasses and herbaceous legumes. The cultivars come from 70 tropical and subtropical species (37 grass, 33 legume) and 60 temperate (24 grass, 36 legume) species. Not all the cultivars are still used, and only a few are important. Almost all cultivars are from introduced species, except for a few native grasses (Astrebla spp., Danthonia spp., Themeda triandra, Microlaena stipoides). In addition to the registered cultivars, there are some additional introductions that are used although not officially registered. Although pastures are grown over a wide area, seed production is restricted to much smaller areas, where there is a reliable growing season (or irrigation is available) and also a reliably dry harvesting season. Seed production of tropical and sub-tropical species is concentrated on the east coast of Queensland and northern New South Wales, with small amounts produced in the Northern Territory. South Australia, Victoria and Western Australia are the major states for the production of clovers and medics, while alfalfa and temperate perennial grasses are produced in all southern states. The average pasture seed production during the three years 1996-98 was 26 000 t, with most production in Victoria and South Australia (Anon., 1999). Pasture development in Australia has drawn on research and experiences elsewhere, but local research has been vitally important to solve uniquely Australian problems, and Australia has developed a strong pasture research effort. Most of this research has been publicly funded. While pasture research continues to be important, the funding and level of activity have declined in recent years. Indeed, reduced funding for pasture research (by both government and industry) was rated the most severe constraint in a recent survey of threats and limitations to the use of tropical pastures (McDonald and Clements, 1999). Not only has the amount of pasture research changed in recent years, the research approach has also altered. Research stations now have a smaller role and a greater proportion of the research is conducted on private properties, some of it with producers participating in the design and conduct of experiments, and interpretation of the results. A major part of the research effort has been the development of new cultivars (plant introduction, breeding, characterization and evaluation), and major national programmes were established for grasses and legumes (Pearson, 1994). These studies have included identifying suitable species for new or difficult environments or for changed farming systems, and also the development of superior strains within existing commercial species. Although cultivar development has been predominantly publicly funded, private industry plays an important role in temperate perennial species. While the development of new cultivars continues, there is now increased research effort on pasture management and the role of pastures in farming systems. The importance of high quality pastures for increased animal production continues, but there are a number of "new" issues (see next section) that have become important areas for research. These include increased water use by deep rooted species (e.g. Medicago sativa, Phalaris aquatica) to dry out soil profiles to reduce soil salinization; the role of perennial grasses for improving soil structure and organic matter levels; and the role of pastures in cereal rotations, both as sources of nitrogen and also for weed control in areas where herbicide-resistant weeds have become a problem. This research is complemented by the commercial evaluation of recently released cultivars and identification of the best ways to incorporate pastures into farming systems. Management of grasslands aims for a desirable composition that gives both high production (including crop products as well as animal products) and maintenance of the resources. The desirable composition varies both temporally and spatially and, given the range of requirements, a mix of species is almost always needed. There are management problems in all pasture zones. In the high rainfall and wheat-sheep zones, low nutritive value of herbage over the summer dry season and low herbage availability in the autumn and winter are important limitations to animal production (Wilson and Simpson, 1993). Productive legumes are important both to provide nitrogen for associate grasses (and following crops) and for their high herbage quality, but, as noted earlier, legume decline is a major issue. In the pastoral zone, major limitations to animal production are herbage quality and quantity, and, in wool-growing areas, vegetable contamination of wool by seeds and fruiting structures of problem species. High grazing pressures have led to the replacement of palatable species by species that avoid high grazing pressure by their unpalatable, fibrous or ephemeral nature. This leads to low herbage quantity (particularly in southern and central Australia, where grasses are replaced by inedible shrubs) and poor quality (particularly in northern Australia, where pastures are dominated by C4 grasses and there is a long dry season). Native shrubs (e.g. species of Cassia, Dodonea and Eromophila) are a major problem in southern and central Australia, while, in the northern areas exotic species are also important (e.g. Acacia nilotica (Plate 9.3), Cryptostegia grandiflora (Plate 9.6), Prosopis spp., Parkinsonia aculeata and Ziziphus mauritiana). 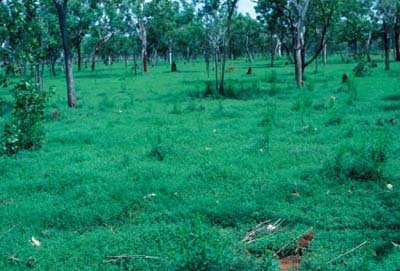 Tothill and Gillies (1992) made a major assessment of the condition of native pastures in northern Australia. They divided the pastures into three classes - sustainable (main desirable species maintaining >75 percent dominance); deteriorating (increased presence (>25 percent) of undesirable pasture species and/or woody weeds); and degraded (predominance of undesirable species). Overall, only 56 percent of pasturelands were rated sustainable, with 32 percent deteriorating and 12 percent degraded. Exotic woody weeds in northern Australia. Dense stand of Cryptostegia grandiflora, with some climbing over trees along a watercourse. In sown tropical pastures both legume dominance and lack of legume persistence are problems in different regions. In the semi -arid tropics, where some stylo (Stylosanthes spp.) pastures are now nearly 30 years old, stylo dominance (particularly Stylosanthes scabra) is causing some concern. The problem is worst on infertile soils, where stylos have been over-sown into native pastures. In stylo-grass pastures, animal preference for grass is very strong during the early wet season (Gardener, 1980) leading to heavy selective grazing of the grasses, which are susceptible at this stage of their growth (Hodgkinson et al., 1989; Mott et al., 1992). A number of measures have been recommended to reduce the stylo dominance - fire, pasture spelling, sowing grazing-tolerant grasses, and raising soil phosphorus levels (McIvor, Noble and Orr, 1998). In the drier subtropics, legume persistence remains a problem, and the success of legume-based pastures has been more variable. Weeds continue to be a problem. During the past decade, unpalatable Sporobolus species (pyramidalis, natalensis, indicus var. major) have increased and extended inland, and Siam weed (Chromolaena odorata) has been recorded for the first time. A number of approaches to pasture management have been suggested. Westoby, Walker and Noy-Meir (1989) proposed a state-and-transition model of vegetation change, where vegetation exists in a number of more-or-less stable states, and moves between these under the influence of management and climatic factors. State-and-transition models have been developed for the major native grassland communities in northern Australia (McIvor and Scanlan, 1994; Stockwell et al., 1994; Orr, Paton and McIntyre, 1994; Hall et al., 1994; McArthur, Chamberlain and Phelps, 1994; Jones and Burrows, 1994) and provide a basis for management by highlighting opportunities to make desirable changes, and also the risks of undesirable changes occurring if management is not proactive. Jones (1992) applied state-and-transition models to sown pastures of Macroptilium atropurpureum and Setaria sphacelata. These pastures can be converted to Digitaria didactyla and Axonopus affinis with sustained heavy grazing; resting from grazing reverses this conversion, but becomes progressively less effective the longer the heavy grazing is maintained. Drawing on a model proposed by Spain, Pereira and Gauldron (1985) for the evaluation of tropical pastures, Kemp (1991) developed a "pasture management envelope", where management aims to maintain pastures within upper and lower limits for productive stable pastures (proportion of key species, e.g. legumes) and for animal performance (forage on offer). Legume contentsbelow the lower limit are unlikely to make important contributions to feed supply and nitrogen fixation, while, above the upper limit, pastures are likely to be unstable and prone to invasion by nitrophilous weeds. Above the upper limit to forage on offer, much of the herbage would not be utilized, while, below the lower limit, herbage intake (and possibly animal survival) would suffer, pasture growth would be reduced and reduced ground cover would expose the soil to erosion. Where pastures are outside this envelope of limiting conditions, management needs to be altered to move the pasture into the envelope. This will often involve changing seasonal grazing pressure (e.g. resting tropical pastures during the early wet season; heavy spring grazing of clover-based pastures). Fire is also used in some areas. While there is little use of fire with sown pastures, it is important for native pastures, particularly in tropical areas to remove accumulated dry herbage, alter grazing behaviour and control woody weeds. In Australia in recent years there has been widespread interest in grazing systems, with considerable debate over the merits of systems based on short grazing periods and long rest periods (e.g. short-duration grazing, time-control grazing, cell grazing) compared with continuous grazing. A number of producers have enthusiastically adopted these systems and report large benefits, both for financial performance and for sustainability of resources (McCosker, 1994; McArthur, 1998; Gatenby, 1999), although other producers have not had positive results (e.g. Waugh, 1997). In contrast to the positive benefits reported from these grazing systems, reviews of grazing systems research conclude that continuous grazing is no worse than rotational grazing, and may be better for animal production (Norton, 1998). Norton (1998) considered reasons for this divergence of views, and concluded that differences were related to uniformity of utilization - this was constant, even in small experimental paddocks, irrespective of grazing system, so the experiments showed no benefit for rotational grazing. However, utilization is often not uniform in large commercial paddocks, and more even utilization is achieved when they are subdivided for rotational systems, leading to production benefits. Despite the success of much pasture development there are major resource issues in Australian grasslands. Soil degradation is estimated to cost Australian agriculture more than one billion dollars annually in lost rural production (Williams, 1999). While soil erosion continues to be a problem, it is not as severe in many areas as during the early to mid -twentieth century, but salinity, accelerated acidification and tree dieback have emerged as important grassland problems in the last twenty years. Whilst some soils are naturally acid, there has been accelerated acidification of soils under legume pastures, both in temperate (e.g. Williams, 1980; Ridley, Helyar and Slattery, 1990) and in tropical areas (Noble, Cannon and Muller, 1997). A number of processes contribute to this: removal of plant (particularly hay making) and animal products; net transfer of nutrients as dung and urine within paddocks; leaching of nitrate (and associated cations) below the root zone; and increases in soil organic matter and cation exchange capacity. The use of acid-tolerant species may provide a partial solution to the problem, but overcoming long-term acidification will require the use of lime. The removal of trees and their replacement by crops and annual pastures has brought about major changes to the hydrological cycle. Dryland salinity now affects about 2.5 million hectares of land, and there is potential for this to increase to more than 12 million hectares (Williams, 1999). Western Australia and Victoria are the states most affected, but New South Wales, South Australia and Queensland also have increasing areas. Reversing these changes to the hydrological cycle will require deeper-rooted plants to reduce recharge by transpiring water before it enters the groundwater, and plants to increase discharge and lower the watertable. Deep-rooted perennial pasture species (e.g. Medicago sativa and Phalaris aquatica) have a role (e.g. Ridley et al., 1997; McCallum et al., 1998; Pitman, Cox and Belloti, 1998), but major tree replanting will probably be required, and has begun in some areas. Native tree dieback (progressive, usually protracted, dying back of branches, often ending in tree death) has become important, and is most severe in long settled, intensively farmed areas, such as the New England Tableland of New South Wales. Repeated defoliation by leaf eating insects is one of many factors involved in the tree dieback syndrome, and sown pastures are implicated in the higher levels of insect defoliation. Two mechanisms are suggested. Firstly, the fertilized improved pastures improve and increase the supply of food for insect larvae and support higher populations of soil invertebrates than native pastures (King and Hutchison, 1983). Secondly, the higher soil nutrient levels also improve the feed quality and attractiveness of the tree leaves for adult insects. The combination of larger populations and attractive foliage greatly increases the grazing of trees by insects. A survey of Queensland properties found increased severity of tree dieback symptoms on properties where more than 50 percent of the area was improved pasture (Wylie et al., 1993). Impact of pasture development on the number of species recorded in experimental pastures near Charter Towers, north Queensland. The values are the means of three years (1990-92) and two sites where the treatments have been fully imposed for at least 4 years. The impacts of pasture development on biodiversity are still being debated. While new species have been added, and become naturalized in many cases, at least some native species have been disadvantaged. However, as surveys show, many other species are present in sown pastures. Pasture development has a number of components, all of which may influence biodiversity - tree clearing, sowing introduced species, fertilizer application, increased grazing pressures, herbicide use, and irrigation. McIvor (1998) examined some of these (tree clearing, superphosphate application, sown species, cultivation, and stocking rates), both separately and in combination, at two sites in north Queensland. The individual management treatments all affected diversity, but the responses varied with season, site and measurement scale. The density of native species decreased with pasture sowing and cultivation, but increased at high stocking rates, and with tree killing at one of the sites. When the treatments were combined, there was a decline in native species as intensity of development increased and the extra sown species were insufficient to prevent a decline in the total number of species (Table 9.2). While much has been learned about the development and use of pastures, pasture management does not exist in isolation and must be combined with other aspects of property management if we are to have sustainable use of our grasslands. Both on- and off-farm impacts and landscape - and regional-scale relationships need to be considered. McIntyre, McIvor and MacLeod (2000) have outlined a set of principles for the grazing of eucalypt woodlands that provide guidelines for achieving environmental sustainability. These need to be combined with other aspects of property and enterprise management and regional planning to give both profitability and conservation of natural resources. Such management will not be easy with a variable and changing climate and variable and often low prices for products, but will be needed for sustainable land use. The strong development of both the Landcare movement and Integrated Catchment Management groups over the last decade provides some hope. These groups of producers and other concerned people have recognized that some problems are beyond the capacity of individual producers, and have combined their resources to conduct activities that aim to improve resource management. Pasture management will always be complex, as we are dealing with mixed plant populations that are defoliated to varying degrees growing in a widely varying climate. There have been great increases in the understanding of the limits to pasture growth and production under Australian conditions, and continuing changes to farming systems in the past and the future will continue to throw up new challenges requiring continuing new knowledge and adaptations. Higher production levels have been a major theme for research and commercial development, but there is an increasing realization that stability and optimization of production systems within an inherently variable environment are objectives that are preferable to an exclusive emphasis on maximizing productivity. European farming in Australia commenced with attempts to transfer European practices to the new environment. However, as the limitations of the new environment were discovered, major changes were made to farming systems as more was learned about the constraints and ways to overcome them. This can be illustrated by historical changes in the wheat industry (Donald, 1965; Malcolm, Sale and Egan, 1996). Initially, poorly adapted, late maturing English varieties were grown each year, depleting soil nutrient levels, so that by the end of the nineteenth century yields declined to half those originally achieved from virgin soils. Major changes were made early in the twentieth century: superphosphate began to be widely used, overcoming the widespread phosphorus deficiency; long fallows (more than one year) were adopted, increasing water supply and nitrogen availability from the breakdown of organic matter; and the early maturing variety Federation was bred for Australian conditions. Yields returned to levels achieved from virgin soils. However, the long fallows meant soils were bare for long periods and erosion (by both water and wind) was a major problem and the soil organic matter levels fell, reducing both nitrogen supply and soil stability, so that there was no further yield improvement after the 1920s. After 1950, ley -farming rotations were widely used, with legume pastures improving both the soil nitrogen status and physical condition. This resulted in spectacular yield increases, but, as mentioned elsewhere, the legumes have become less effective. With the decline of legume pastures and low prices for animal products, some farmers switched from ley-pasture rotation s to continuous cropping using grain legumes and nitrogen fertilizer to provide nitrogen, no- or minimum-tillage to maintain soil structure, and herbicides for weed control. Herbicide-resistant plants have developed in a number of troublesome weeds (e.g. Avena spp., Lolium rigidum and Raphanus raphanistrum) and there are doubts if such a system can maintain soil organic matter and physical properties (Malcolm, Sale and Egan, 1996). A pasture phase in the farming systems may be necessary to overcome these problems. Nitrogen is a major limiting nutrient in grasslands, but nitrogen fertilizer use on grasslands has been low in Australia due to the high costs relative to the value of livestock products, and there are also problems with soil acidification and nitrate contamination of water supplies. Use of nitrogen fertilizers remains restricted to situations offering high financial returns, such as for winter feed supplies on dairy farms in the subtropics. The productive use of legumes has been a major success story of Australian farming. Prior to the rapid period of pasture development that commenced in the 1950s (Figure 9.4) many pastures were sparse, heavily infested with rabbits, contained inferior annual species, and soils were badly eroded. In the cereal growing areas, dust storms occurred regularly, removing much of the surface soil, and soil organic matter levels had fallen, reducing soil stability and lowering soil nitrogen levels (Malcolm, Sale and Egan, 1996). Temperate pastures based on Trifolium and Medicago species, with application of superphosphate, provided greatly increased animal and crop production and improved soil fertility from the 1950s (Donald, 1965). However, as outlined above, the effectiveness of this system has declined. Despite this, legume-based pastures continue to provide production benefits, even if at a lower level than in the past. The experiences in southern Australia provided a model for northern Australia and optimistic estimates were made of the area suitable for sown pastures in the tropics, such as 50-60 million hectares in Queensland (Davies and Eyles, 1965; Ebersohn and Lee, 1972; Weston et al., 1981), although later estimates reduced this to 22 million hectares (Walker and Weston, 1990). Initial hopes for twining legumes (e.g. Macroptilium atroprupureum and Desmodium spp.) were not fulfilled, although some use of these species continues. Their elevated growing points are sensitive to grazing (Clements, 1989) and these species lack persistence under heavy grazing. There are successful developments based on Stylosanthes species and Leucaena leucocephala (Plate 9.7) and the area sown to these species continues to increase. A number of other tropical legumes have smaller but still successful roles e.g. Aeschynomene americana, Chamaecrista rotundifolia, Centrosema pascuorum and Vigna parkeri. There is an increasing demand for ley legumes for cropping systems in the tropics and sub-tropics. The cropping industry is situated mainly on clay soils which previously supported grassland or brigalow. However years of continuous cropping has depleted soil fertility and yields and grain protein content s are falling. There is an urgent need to restore the fertility and legume-leys (e.g. Clitoria ternatea) can play a key role (Dalal et al., 1991). 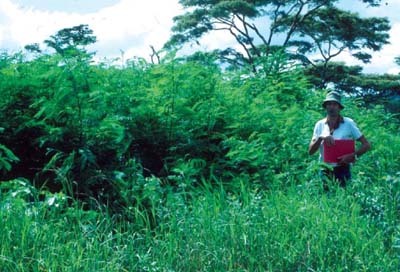 Leucaena leucocephala, a high quality productive shrub legume capable of providing high levels of animal production. While there have been positive changes from the use of legumes, such as increased production and soil improvement, legumes can also have negative impacts, such as accelerated soil acidification. There will be a continuing need for research and development to overcome problems that arise, as well as continuing management - using legumes is not simply a matter of selecting and sowing a species and expecting it to survive and produce with little management. "our native plants have neither actual or potential value as artificially sown species ... they are incapable of high production, of response to high levels of fertility. They are adapted ... to poor soils, to light grazing ...and drier climatic conditions ..."
However, few pastures contain only sown species and some native species have survived - in the strongly winter dominant rainfall areas there are few, but where there is a summer rainfall component (Wilson and Simpson, 1993), or in the tropics where rainfall is summer dominant, important native species remain in sown pastures and many areas have not been sown. While the conclusion of Donald (1970) remains generally true for high fertility conditions, the increases in soil fertility following the widespread use of subterranean clover and superphosphate have not been sustained, and many areas have "poor soils, drier conditions" where the native species are adapted. Many early comparisons of native and introduced species were biased (Wilson and Simpson, 1993) and more recent assessments have concluded that there is a role for native species as they have valuable agronomic features and can provide good quality herbage at times of the year (Archer and Robinson, 1988; Robinson and Archer, 1988). The native pastures will generally not support the high stocking rates that fertilized, introduced pastures can support. However, at low to moderate rates, their presence and contribution can be exploited and they will have a continuing role in animal production. Although exotic pasture species have provided large economic benefits to Australia, as a number of pasture plants have become naturalized increasing attention is being given to their impacts on the environment. A number have been listed as environmental weeds, i.e. species that invade native communities and cause changes to the vegetation structure (species composition and abundance) or the function of ecosystems, or both. Two features important in pasture species are common in these environmental weeds - the ability to invade or colonize new or unsown areas, and the ability to dominate vegetation where they occur. In a recent list of environmental weeds in Australia, 11 of the 55 major and significant ones were pasture species; of the top 18, six were pasture species - Brachiaria mutica, Cenchrus ciliaris, Echinochloa polystachya, Glyceria maxima, Hymenachne amplexicaulis and Pennisetum polystachyon (Humphries, Groves and Mitchell, 1991). Where conditions are suitable (e.g. little competing vegetation, suitable soil fertility and grazing regimes) all these species are capable of forming almost monospecific stands. Under the recently developed National Weeds Strategy, the import entry protocols for assessing the weed potential of all proposed new plant imports have been strengthened to prevent the introduction of plants with weed potential. However, there are a number of pasture species now well established or naturalized that are not currently considered weeds, but might well be in the future. Products from pastures and grasslands have made great contributions to the Australian economy - during the nineteenth century the native grasslands supported the grazing industries (particularly wool) that, together with gold, made Australia prosperous. During the twentieth century, temperate pastures based on subterranean clover and other legumes, and to a lesser extent tropical pastures, raised production levels and financial returns to previously unachievable levels. Future pasture management will involve concerns for both productivity and the environment both on- and off-property. As a recent assessment of the sustainability of Australian agriculture has shown, long-term productivity has been increasing for all broadacre and dairy industries, but resource issues - sodic and acid soils, native vegetation, salinity - have also become important and increasing problems (SCARM, 1998). Pastures, both sown and native, will continue to be important for both production and environmental impacts. As discussed earlier, rates of pasture development are closely linked to seasonal conditions and the profitability of farming enterprises, and this situation is likely to continue. Costs of pasture development and maintenance have been and remain a major concern to growers. A recent survey (Clements, 1996; McDonald and Clements, 1999) found that of 21 possible constraints to the future use of tropical pasture plants, farmers rated uncertain commodity prices, high cost of establishment and costs of maintaining improved pastures among the top four. Agriculture is declining in relative importance in the economy and will continue to do so, but it will remain an important contributor to both the national and regional economies for many years. Grasslands and pastures will remain important - in many areas they provide the only means of producing a valuable product where there are no viable alternatives. In arable areas, grasslands will continue to have a role in crop rotations for increasing nitrogen supply, disease breaks and weed control as herbicide resistance reduces the effectiveness of herbicides. ABARE [Australian Bureau of Agricultural and Resource Economics]. 1998. Australian Commodity Statistics 1998. Australian Bureau of Agricultural and Resource Economics, Canberra ACT, Australia. Anon[ymous]. 1999. Agriculture 1997-98. Australian Bureau of Statistics Catalogue No. 7113.0. Archer, K.A. & Robinson, G.G. 1988. Agronomic potential of native grass species on the northern tablelands of New South Wales. II. Nutritive value. Australian Journal of Agricultural Research, 39: 425-436. Carnahan, J.A. 1989. Natural Vegetation, Australia. Department of Administrative Services, Canberra ACT, Australia. Clements, R.J. 1989. Rates of destruction of growing points of pasture legumes by grazing cattle. pp. 1027-1028, in: Proceedings of the 16th International Grassland Congress. Clements, R.J. 1996. Pastures for prosperity. 3. The future for new tropical pasture species. Tropical Grasslands, 30: 31-46. Crofts, F. 1997. Australian pasture production: the last 50 years. pp. 1-16, in: J.V. Lovett and J.M. Scott (eds). Pasture Management and Production. Melbourne, Australia: Inkata Press. Dalal, R.C., Strong, W.M., Weston, E.J. & Gaffney, J. 1991. Sustaining multiple production systems. 2. Soil fertility decline and restoration of cropping lands of sub-tropical Queensland. Tropical Grasslands, 25: 173-180. Davidson, B.R. & Davidson, H.F. 1993. Legumes: The Australian Experience. Taunton, UK: Research Studies Press. Davies, J.G. 1951. Contributions of agricultural research in pastures. Journal of the Australian Institute of Agricultural Science, 17: 54-66. Davies, J.G. & Eyles, A.G. 1965. Expansion of Australian pastoral production. Journal of the Australian Institute of Agricultural Science, 31: 77-93. Donald, C.M. 1965. The progress of Australian agriculture and the role of pastures in environmental change. Australian Journal of Science, 27: 187-198. Donald, C.M. 1970. Temperate pasture species. pp. 303-320, in: R.M. Moore (ed). Australian Grasslands. Canberra ACT, Australia: Australian National University Press. Ebersohn, J.P. & Lee, G.R. 1972. The impact of sown pastures on cattle numbers in Queensland. Australian Veterinary Journal, 48: 217-223. Eyles, A.G. & Cameron, D.G. 1985. Pasture Research in Northern Australia - its History, Achievements and Future Emphasis. Brisbane, Australia: CSIRO. Fitzpatrick, E.A. & Nix, H.A. 1970. The climatic factor in Australian grassland ecology. p. 326, in: R.M. Moore (ed). Australian Grasslands. Canberra ACT, Australia: Australian National University Press. Frisch, J.E. & Vercoe, J.E. 1977. Food intake, eating rate, weight gains, metabolic rate and efficiency of feed utilization in Bos taurus and Bos indicus crossbred cattle. Animal Production, 25: 343-358. Gardener, C.J. 1980. Diet selection and liveweight performance of steers on Stylosanthes hamata-native grass pastures. Australian Journal of Agricultural Research, 31: 379-392. Gatenby, A. 1999. Rangeland management: sustainable agriculture requires sustainable profit. pp. 165-172 (Vol. 2 - Agriculture), in: Outlook 99. Proceedings of the National Agriculture and Resource Outlook Conference, Canberra ACT, Australia, 1999. Canberra ACT, Australia: Australian Bureau of Agricultural and Resource Economics. Groves, R.H. & Williams, O.B. 1981. Natural grasslands. pp. 293-316, in: R.H. Groves (ed). Australian Vegetation. Cambridge, UK: Cambridge University Press. Hall, T.J., Filet, P.G., Banks, B. & Silcock, R.G. 1994. A state and transition model of the Aristida -Bothriochloa pasture community of central and southern Queensland. Tropical Grasslands, 28: 270-273. Hodgkinson, K.C., Ludlow, M.M., Mott, J.J. & Baruch, Z. 1989. Comparative responses of the savanna grasses Cenchrus ciliaris and Themeda triandra to defoliation. Oecologia, 79: 45-52. Hooper, S. & Helati, S. 1999. Pasture: establishment, maintenance and expenditure on grain producing farms. pp. 47-59, in: Australian Farm Surveys Report 1999. Canberra ACT, Australia: Australian Bureau of Agricultural and Resource Economics. Hubble, G.D. 1970. Soils. pp. 44-58, in: R.M. Moore (ed). Australian Grasslands. Canberra ACT, Australia: Australian National University Press. Humphries, S.E., Groves, R.H. & Mitchell, D.S. 1991. Plant invasions: The incidence of environmental weeds in Australia. Kowari, 2: 1-134. Jones, P. & Burrows, W.H. 1994. A state and transition model for the mulga zone of south-west Queensland. Tropical Grasslands, 28: 279-283. Jones, R.J., McIvor, J.G., Middleton, C.H., Burrows, W.H., Orr, D.M. & Coates, D.B. 1997. Stability and productivity of Stylosanthes pastures in Australia. 1. Long-term botanical changes and their implications in grazed Stylosanthes pastures. Tropical Grasslands, 31: 482-493. Jones, R.M. 1992. Resting from grazing to reverse changes in sown pasture composition: application of the state-and-transition model. Tropical Grasslands, 26: 97-99. Jones, R.M., McDonald, C.K. & Silvey, M.W. 1995. Permanent pastures on a brigalow soil: the effect of nitrogen fertiliser and stocking rate on pastures and liveweight gain. Tropical Grasslands, 29: 193-209. Keig, G. & McAlpine, J.R. 1974. WATBAL: A computer system for the estimation and analysis of soil moisture regimes from simple climatic data. CSIRO Division of Land Use Research Technical Memorandum, No. 74/4. Kemp, D. 1991. Perennials in the tablelands and slopes: defining the boundaries and manipulating the system. Proceedings of the Annual Conference of the Grassland Society of New South Wales, 6: 24-30. King, K.L. & Hutchison, K.J. 1983. The effects of sheep grazing on invertebrate numbers and biomass in unfertilised natural pastures of the New England Tablelands (NSW). Australian Journal of Ecology, 8: 245-255. Leeper, G.W. (ed). 1970. The Australian Environment. 4th ed. Carlton, Australia: Melbourne University Press. Leigh, J.H. & Mulham, W.E. 1966a. Selection of diet by sheep grazing semi -arid pastures of the Riverine Plain. 1. A bladder saltbush (Atriplex vesicaria)-cotton bush (Kochia aphylla) community. Australian Journal of Experimental Agriculture and Animal Husbandry, 6: 460-467. Leigh, J.H. & Mulham, W.E. 1966b. Selection of diet by sheep grazing semi -arid pastures of the Riverine Plain. 2. A cotton bush (Kochia aphylla)-grassland (Stipa variabilis -Danthonia caespitosa) community. Australian Journal of Experimental Agriculture and Animal Husbandry, 6: 468-474. Leigh, J.H. & Mulham, W.E. 1967. Selection of diet by sheep grazing semi -arid pastures of the Riverine Plain. 3. A bladder saltbush (Atriplex vesicaria)-pigface (Disphyma australe) community. Australian Journal of Experimental Agriculture and Animal Husbandry, 7: 421-425. McArthur, S. 1998. Practical evidence supports cell grazing benefits. Australian Farm Journal Beef, September 1998: 8-9. McArthur, S.R., Chamberlain, H.J. & Phelps, D.G. 1994. A general state and transition model for the mitchell grass, bluegrass-browntop and Queensland bluegrass pasture zones of northern Australia. Tropical Grasslands, 28: 274-278. McCallum, M.H., Connor, D.J. & OLeary, G.J. 1998. Lucerne in a Wimmera farming system: water and nitrogen relations. pp. 258-261, in: Proceedings of the 9th Australian Agronomy Conference. Parkville, Australia: Australian Agronomy Society. McCosker, T. 1994 The dichotomy between research results and practical experience with time control grazing. pp. 26-31, in: Australian Rural Science Annual 1994. Sydney, Australia: Percival Publishing. McDonald, C.K. & Clements, R.J. 1999. Occupational and regional differences in perceived threats and limitations to the future use of sown tropical pasture plants in Australia. Tropical Grasslands, 33: 129-137. McIntyre, S., McIvor, J.G. & MacLeod, N.D. 2000. Principles for sustainable grazing in eucalypt woodlands: landscape -scale indicators and the search for thresholds. pp. 92-100, in: P. Hale, A. Petrie, D. Moloney and P. Sattler (eds). Management for Sustainable Ecosystems. University of Queensland, Brisbane, Australia: Centre for Conservation Biology. McIvor, J.G. 1984. Phosphorus requirements and responses of tropical pasture species: native and introduced grasses and introduced legumes. Australian Journal of Experimental Agriculture and Animal Husbandry, 24: 370-378. McIvor, J.G. 1998. Pasture management in semi -arid tropical woodlands: Effects on species diversity. Australian Journal of Ecology, 23: 349-364. McIvor, J.G., Noble, A.D. & Orr, D.M. 1998. Stability and productivity of native pastures oversown with tropical legumes. North Australia Program Occasional Publication No. 1. Meat Research Corporation, Sydney, Australia. McIvor, J.G. & Scanlan, J.C. 1994. A state and transition model for the northern speargrass zone. Tropical Grasslands, 28: 256-259. McTaggart, A. 1936. A survey of the pastures of Australia. CSIR Bulletin, No. 99. Malcolm, L.R., Sale, P. & Egan, A. 1996. Agriculture in Australia. Melbourne, Australia: Oxford University Press. Martin, P. 1996. Ownership and management of broadacre and dairy farms. pp. 46-47, in: Farm Surveys Report 1996. Canberra ACT, Australia: Australian Bureau of Agricultural and Resource Economics. Martin, P., Riley, D., Jennings, J., ORourke, C. & Toyne, C. 1998. The Australian Beef Industry 1998. ABARE Research Report, No. 98.7. Moore, R.M. (ed). 1970. Australian Grasslands. Canberra ACT, Australia: Australian National University Press. Moore, R.M. 1993. Grasslands of Australia. pp. 315 -360, in: R.T. Coupland (ed). Natural Grasslands Eastern Hemisphere and Résumé. Amsterdam, The Netherlands: Elsevier. Morley, F.H.W. 1961. Subterranean clover. Advances in Agronomy, 13: 57-123. Mott, J.J., Ludlow, M.M., Richards, J.H. & Parsons, A.D. 1992. Effects of moisture supply in the dry season and subsequent defoliation on persistence of the savanna grasses Themeda triandra, Heteropogon contortus and Panicum maximum. Australian Journal of Agricultural Research, 43: 241-260. Mott, J.J., Williams, J., Andrew, M.H. & Gillison, A.N. 1985. Australian savanna ecosystems. pp. 56-82, in: J.C. Tothill and J.J. Mott (eds). Ecology and Management of the Worlds Savannas. Canberra ACT, Australia: Australian Academy of Science. Myers, R.J.K & Robbins, G.B. 1991. Sustaining productive pastures in the tropics. 5. Maintaining productive sown grass pastures. Tropical Grasslands, 25: 104-110. Noble, A.D., Cannon, M. & Muller, D. 1997. Evidence of accelerated soil acidification under Stylosanthes dominated pastures. Australian Journal of Soil Research, 35: 1309-1322. Norton, B.E. 1998. The application of grazing management to increase sustainable livestock production. Animal Production in Australia, 22: 15-26. Orr, D.M., Paton, C.J. & McIntyre, S. 1994. A state and transition model for the southern speargrass zone of Queensland. Tropical Grasslands, 28: 266-269. Pearson, C.J. 1994. The Australasian temperate pasture grass improvement program. New Zealand Journal of Agricultural Research, 37: 265-268. Pitman, A., Cox, J.W. & Belloti, W.D. 1998. Water usage and dry matter production of perennial pasture species down a duplex toposequence. pp. 268-269, in: Proceedings of the 9th Australian Agronomy Conference. Parkville, Australia: Australian Agronomy Society. Ridley, A.M., Helyar, K.R. & Slattery, W.J. 1990. Soil acidification under subterranean clover (Trifolium subterraneum L.) in northeastern Victoria. Australian Journal of Experimental Agriculture, 30: 195-201. Ridley, A.M., White, R.E., Simpson, R.J. & Callinan, L. 1997. Water use and drainage under phalaris, cocksfoot and annual ryegrass pastures. Australian Journal of Agricultural Research, 48: 1011-1023. Robinson, G.G. & Archer, K.A. 1988. Agronomic potential of native grass species on the northern tablelands of New South Wales. I. Growth and herbage production. Australian Journal of Agricultural Research, 39: 415-423. SCARM [Standing Committee on Agriculture and Resource Management]. 1998. Sustainable Agriculture: Assessing Australias Recent Performance. Standing Committee on Agriculture and Resource Management Technical Report No. 70. CSIRO, Canberra ACT, Australia. Seibert, B.D. 1982. Research findings in relation to future needs. Proceedings of the Australian Society of Animal Production, 14: 191-196. Spain, J., Pereira, J.M. & Gauldron, R. 1985. A flexible grazing management system proposed for the advanced evaluation of associations of tropical grasses and legumes. pp. 1153-1155, in: Proceedings of the 15th International Grassland Congress. Kyoto, Japan, 1985. Nishi-nasunu, Japan: Japanese Society of Grassland Science. Stockwell, T.G.H., Andison, R.T., Ash, A.J., Bellamy, J.A. & Dyer, R.M. 1994. Development of state and transition models for pastoral management of the golden beard grass and limestone grass pasture lands of NW Australia. Tropical Grasslands, 28: 260-265. Thackway, R. & Cresswell, I.D. (eds). 1995. An Interim Biogeographic Regionalisation for Australia. Canberra ACT, Australia: Australian Nature Conservation Agency. Tothill, J.C. & Gillies, C. 1992. The pasture lands of northern Australia. Tropical Grassland Society of Australia Occasional Publication, No. 5. Trumble, H.C. & Donald, C.M. 1938. The relation of phosphate to the development of seeded pasture on a podsolised sand. Council for Scientific and Industrial Research Bulletin 116, 12: 1-49. Walker, B. 1991. Sustaining tropical pastures - summative address. Tropical Grasslands, 25: 219-223. Walker, B. & Weston, E.J. 1990. Pasture development in Queensland - A success story. Tropical Grasslands, 24: 257-268. Waugh, W. 1997. Pastures under adverse conditions - handling what you have: grazing systems in practice. pp. 91-94, in: Proceedings of the 12th Annual Conference of the Grassland Society of New South Wales. Dubbo, Australia, 1997. Orange, Australia: Grassland Society of New South Wales. Westoby, M., Walker, B.H. & Noy-Meir, I. 1989. Opportunistic management for rangelands not at equilibrium. Journal of Range Management, 42: 266- 274. Weston, E.J., Harbison, J., Leslie, J.K., Rosenthal, K.M. & Mayer, R.J. 1981. Assessment of the agricultural and pastoral potential of Queensland. Technical Report, No. 27. Agricultural Branch, Queensland Department of Primary Industries, Brisbane, Australia. Williams, C.H. 1980. Soil acidification under clover pasture. Australian Journal of Experimental Agriculture and Animal Husbandry, 20: 561-567. Williams, J. 1999. Biophysical aspects of natural resource management. pp. 113 123 (Vol. 1 - Commodity Markets and Resource Management), in: Outlook 99. Proceedings of the National Agriculture and Resource Outlook Conference, Canberra, 1999. Canberra ACT, Australia: Australian Bureau of Agricultural and Resource Economics. Wilson, A.D. & Simpson, R.J. 1993. The pasture resource base: status and issues. pp. 1-25, in: D.R. Kemp (ed). Pasture Management Technology for the 21st Century. Melbourne, Australia: CSIRO. Wylie, F.R., Johnson, P.J.M. & Eisemann, R.L. 1993. A survey of native tree dieback in Queensland. Queensland Department of Primary Industries, Forest Research Institute Research Paper, No. 16.